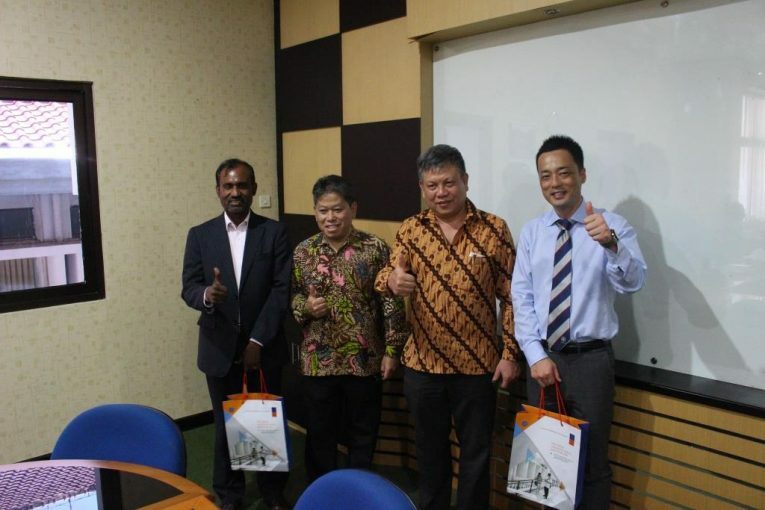 October, 4th 2018, Professor Jogiyanto Hartono M., PhD and Professor Catur Sugiyanto, PhD, as the chair of the accounting and economics study program at the Master of Science and Doctorate (MD) program FEB UGM held a meeting with the International University of Japan (IUJ). The meeting was held at the MD FEB UGM Building, namely in the 3rd-floor courtroom. The IUJ was represented by Professor N. S. Cooray and Mr Wada. According to the AACSB accreditation, the cooperation procedure between universities must be within the scope of a fellow university recipient of AACB accreditation. In the minutes of the meeting, IUJ was interested in cooperating with the MD FEB UGM program, as the collaboration had been carried out by IUJ with the Masters in Development Economics (MEP) and also Master of Management (MM) programs. Specifically, the form of cooperation that will be established between MD FEB-UGM and IUJ is a dual program specifically for students of the master level, considering that IUJ has excellent capabilities for master’s programs. At this meeting, the UGM MD-FEB program also examined the possibility of obtaining the same scholarship obtained by MEP from the Indonesian BAPPENAS. It is a big opportunity for MD FEB-UGM considering that BAPPENAS RI itself can provide scholarships for dual programs. Administrative requirements of students who will take dual programs will be formed flexibly by the agreement between one party and the other. During the trip to make the following dual program, students will also be included in the apprenticeship program by IUJ. It is done in the context of exposure and getting more learning as long as students take dual programs in Japan.